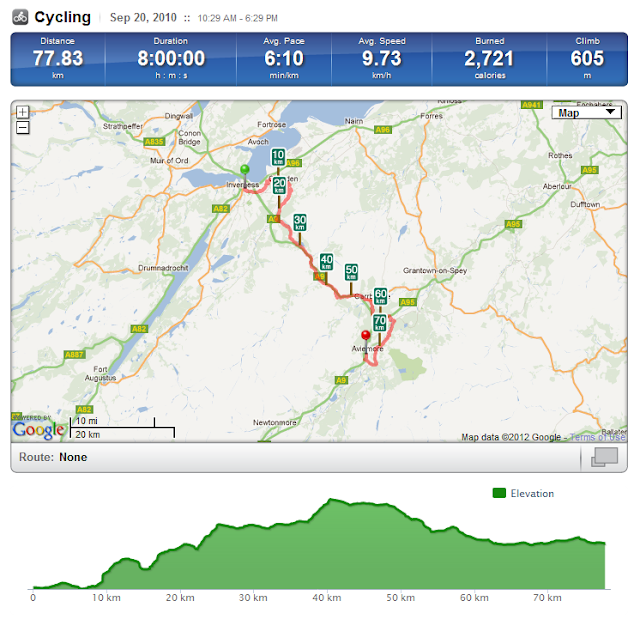 Despite the heavy rain this morning this was a great bike ride and the area around Aviemore is simply full of places to go and things to do. I'm sure it was great in part not just because of the scenery but also as so much was so quiet. The use as a cycle route of the old A9 is a great facility and I think I was see more of this tomorrow as I head further south. Leaving Inverness to the east, the route took me past the Culloden battlefield - site of the last battle to take place on UK mainland in 1746, Jacobite rebellions and all that. I didn't stop here preferring to view the slightly older Clava Chambered Cairns (although I've since read there are well preserved chambered cairns on Orkney). Pictish history (3-4 thousand years ago). Also info at http://en.wikipedia.org/wiki/Clava_cairn. It must have been a fun activity to see the sun shine through a different angles into the structures during the course of a year. However, I can see how Christianity had a few things going for it - probably more of an indoor focus must help. Anyway - very solid designs. Just beyond this on my route and looking back eastwards, one of the many structures I saw today related to railway construction looked far more magnificent than yesterday's 1982 Kessock Bridge. This viaduct on the single track railway opened as Inverness and Aviemore Direct Railway (Highland Railway) in 1898. Culloden Battlefield and the Clava Chambers Cairns are adjacent to the trees left of the largest span. Further south along the same railway line and adjacent to NCN7, I came across this interesting wooden viaduct; it turns out that it was refurbished and strengthened in the last few years and won some awards. The Moy Viaduct, 1887, is the last remaining timber bridge on the mainline railway in Scotland. In 2003 it was sympathetically strengthened and repaired, due to degradation of timbers through fungal decay, by the installation of a new structure within the framework of the original bridge and treatmetn of the timbers to prevent further decay. I was relieved to reach the A9(T) and the Slochd Summit, which at 406m was the highest I was going today, as I my fingers have starting hurting from the cold! Fortunately the cycle route soon fell away from the busy trunk road, where the dedicated cycle track seems prone always to have glass on it, and back onto the quieter back roads. The NCN Route 7 runs down towards the River Spey and is clearly marked on either side of the road with large signs every 1km or so and all drivers I came across were particularly well behaved I thought. The route leads through a number of villages includes Carrbridge, see bridge below, and Boat of Garten where one of the stations of the Strathspey Steam Railway is situated; alas I couldn't try it out as although it still runs in September, its working week starts on a Wednesday. Old packhorse bridge in Carrbridge built 1717 as at the time there was no point where the River Dulnain, a tributary of the Spey, could be crossed when it was in spate and burials at the Church of Duthil were often delayed. There are many off-road bicycle routes through the area which look spectacular. However, although the surface on the photos didn't seem to harsh, I did consider it wise not to risk losing all the panniers and rider into a teaming burn at this stage on my journey. The Cairngorms await me in the morning but in the meantime I am enjoying the peaceful solitude of the Spey Valley finishing reading my latest novel - which fortunately will make the pannier a little lighter! Bridgetastic day! A trio of very different arch-type structures, all fascinating in their own way.